The center of Washington State, the Apple Capital of the world, is beautiful Wenatchee, WA. 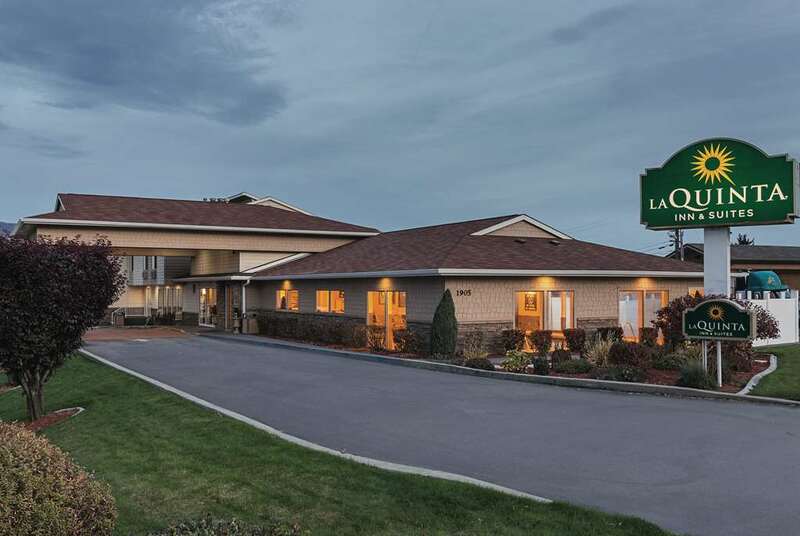 The La Quinta Inn & Suites Wenatchee is conveniently located 1 mile north of downtown Wenatchee, off Hwy 2 at 1905 N Wenatchee Avenue. Off I-90 from Blewitt Pass at exit 85 or from Quincy exit 151. We are located a short 30-minute drive west, on Hwy 2, to Leavenworths Bavarian Village and only 40 minutes north on Hwy 97 to Lake Chelan. Exceptional guest amenities await you at the La Quinta Inn & Suites Wenatchee, including: 24-hour indoor pool & spa with outdoor patio area, 24-hour fitness and business center, free high-speed Wi-Fi, fresh baked cookies every evening, and Bright Side Breakfast that includes a variety of hot and cold items. Guests may select from a variety of room types that include: mini-fridge, microwave, flat panel HDTV, coffemaker, Hairdryer, Iron & Ironing Board. Our location is convenient to Town Toyota Center, Numerica Performing Arts Center, Wenatchee Convention Center, Downtown Wenatchee and the annual May Apple Blossom Festival. We Are near many areas where sports and outdoor enthusiasts enjoy like: AppleSox Baseball, Wenatchee Wild Hockey, Wenatchee Valley Super Oval, Apple Capital Loop Trail, Hike or mountain bike the many surrounding recreational parks, White Water Rafting on the Wenatchee River and Mission Ridge Ski Resort. Teams host their tournaments at our waterfront Walla Walla Point Park. Golfers delight in a variety of popular courses including, Highlander Golf Course and Desert Canyon Golf Resort. Wineries and breweries are abundant and Pybus Public Market features great dining, local produce, meats, wine, brews and area talent. We know you will have a great experience at the La Quinta Inn & Suites in the Wenatchee Valley. Leavenworth Bavarian VillageBavarian Town. Festivals year round, Gift Shops, Resturants.